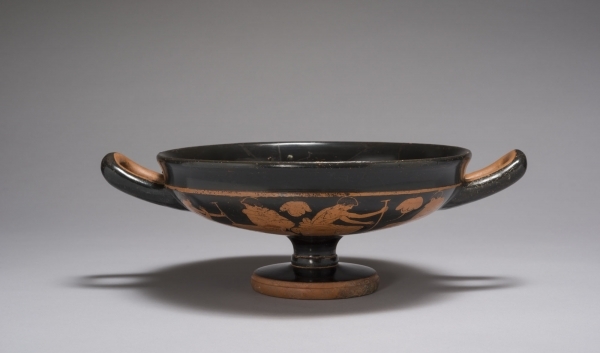 A kylix is a Greek drinking cup with a wide brim and shallow bowl. The cup stands on a short stem on the bottom, and attached at the sides are two handles. The particular kylix that we are looking at is decorated on the sides and on the inside of the bowl with images of reclining drinkers. Kylices were associated with symposia: occasions where male Greek citizens gathered to drink and be social. The figure in the bowl is playing a favorite game of the symposium, kottabos, in which one flings wine from one’s cup at another person. In ancient Greece, wine and drinking were viewed as evidence of humanity’s capacity for rationality and empathy, as well as for self-destruction. Leon Kass, in his book The Hungry Soul, argues that wine has the capacity to relieve stress and facilitate positive relationships with others, but at the same time brings our latent animalistic tendencies to the surface. The Greeks seem to understand this, as evidenced by the characters in Plato’s symposium. The characters of the play all gather to drink together and bond over the shared enjoyment of wine, yet the wisest of them, Socrates, does not get drunk. Conversely, the drunkest character of the story, Alciabades, makes a fool of himself. The construction and imagery of this kylix displays a friendly attitude towards wine in Greek culture, while the Symposium suggests that the Greeks were aware of the hidden dangers of drinking.